Buy new or buy used? That’s a tough call for a boat buyer, especially a first-timer. There’s no right or wrong answer. It all depends on you: your tastes, your budget, your mechanical aptitude. What makes your smile wider? A mint condition new prize or a bargain cleverly bought and burnished? Some say the sweet spot is a used boat that is a couple of years old, bought from a dealer you trust, but you decide. Here are some pointers from both sides. Who doesn’t like stuff shiny and new? No need to wonder how the boat’s been used or misused, or if it’s been adequately winterized and commissioned. There is no history to uncover, because you’ll write this boat’s on-water biography. You can buy exactly what you want and not just what’s on the pre-owned market. You’ll be getting the latest, greatest technology — the stuff people gather to drool over. If something does go awry, you’ll have a manufacturer’s warranty to back you up. That warranty is served by the selling dealer, which is a good reason to buy nearby. You can rig it the way you want with the latest gear selected precisely for your purpose. Unless you buy a boat-and-motor combo with the lowest-offered powerplant, it’s probably a satisfying match. You don’t have to get an answer to the most troubling question: Why is this used boat for sale? Bucks! Someone else has covered the 25 to 33 percent depreciation that takes place when a new boat is towed off the dealer’s lot. With a used boat, you get more boat for fewer dollars, lower cost per year of ownership, and less on the line if you decide a different style or size boat would better serve you. It sounds funny, but there’s peace of mind in knowing you’re not going to put the first scratch or ding in the boat. Any initial bugs in boat or motor have likely surfaced and been dealt with. For reassurance, and before signing, get a marine survey (see National Association of Marine Surveyors or Society of Accredited Marine Surveyors). Marine surveyors see what you can’t and look where you won’t. First, get a survey. Then smile and buy, whittle down the price, draft your own to-do list, or walk away. You get time-tested technologies. If a manufacturer brought out a bad boat or balky motor, the Internet and other sources will wave you off. You can choose a style of sale — from the trade-in or used stock of a dealer, who has to cover overhead but has a reputation to guard and a service bay; from a broker, who has reduced overhead costs; or from a private seller, who may be most motivated. Boat ownership is surprisingly affordable. Yes, there are additional costs beyond the purchase price, but that’s true of any similar recreational vehicle, whether it’s a motorcycle, ATV, or RV. Here’s a rundown of what to expect. 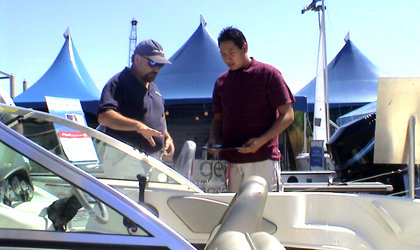 Registration — Like most motorized vehicles, a boat must be registered before use. It’s a relatively nominal cost, but can vary widely by state. California charges a flat fee of $37 or $65, depending on whether the owner registers in an odd or even year. Most states charge by size range, but rarely exceed $150. Insurance — Insurance is comparable to other forms of motorized recreation. Cost varies by coverage; look for physical damage protection (theft, collision, storm, etc) as well as liability. Consider attending a boating safety course to receive a discounted rate. Storage Options — It costs nothing to keep your boat at your own dock, or stored in your garage or driveway. If those options aren’t available, dockage can be arranged at local marinas; rates vary by size, location, and even season, but typically range between $7-$32/ft month. “High-and-dry” facilities or local storage areas are also viable options. Winter storage? Add the price of a fall winterization to your budget but don’t fret. It’s relatively inexpensive, and cheap insurance to guarantee your boat is ready to hit the water come Spring. Fuel — Again, an obvious expense, but planning can substantially lower the cost. If possible, buy away from the water. The majority of boats sold in the U.S. are 26’ or less and trailered to the water. New owners are also often surprised at how little fuel they actually burn; considerable time is often spent at lower speeds, with the engine off, fishing or “coving” with friends at anchor or nosed into the sandbar. Maintenance — Simple upkeep will substantially lower maintenance costs. Flush your engine after saltwater use, keep your craft covered when not in use, and stick to your manufacturer’s suggested timeline on routine maintenance like oil changes. Do-it-yourselfers may be able to effectively handle the latter. Those who prefer a dealer service center handle the routine maintenance can expect to spend between $100-$300 for these annual services. If you are considering a used boat, be sure to check out the costs you should expect.